In the dwarf galaxy, the Great Magellanic Cloud discovered the most complex organic matter ever encountered outside the Milky Way. New observations performed with the Atacama Large Millimeter / submillimeter Array (ALMA) complex in the Atacama Desert show that interstellar matter in the Large Magellanic Cloud contains molecules of rather complex organic substances consisting of carbon, nitrogen and oxygen atoms, methanol, dimethyl ether and methyl formate. Astronomers consider heavy all elements heavier than lithium and call them “metals.” Such elements are formed mainly as a result of supernova explosions, therefore, in order to create complex chemical compounds in interstellar matter, it is necessary that many supernovas, possibly more than one generation, explode in the galaxy. The Large Magellanic Cloud is ten times smaller than our Galaxy in diameter and contains only one-twentieth of the number of stars in the Milky Way. Such small sizes and masses do not promise a wide variety of chemical elements and their compounds; until now it was believed that there are relatively few carbon, oxygen, nitrogen and their derivatives in the LMC. Methyl formate, the methyl ester of formic acid found in LMO, is by far the highest molecular weight that has been found outside our Galaxy. In the interstellar substance of the Milky Way, a more complex organics is found: aromatic hydrocarbons and even amino acids. Astronomers obtained spectra of methyl formate, observing the Large Magellanic Cloud in the millimeter range. The radiation source is two regions with an increased density of matter, where an active process of formation of new stars is taking place; these regions are known as “hot cores”. 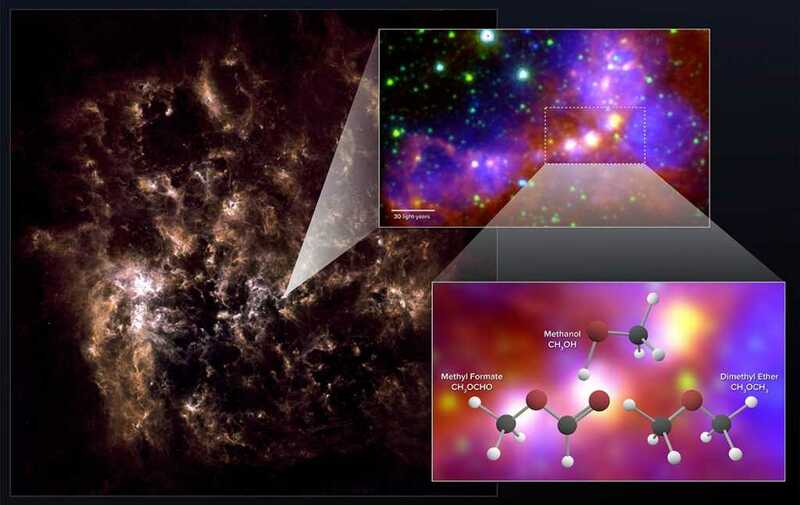 Where scientists have found methyl formate, new stars are just about to catch fire. Organics have a chance to survive these events and to be inside the protoplanetary disk, and then to enter the planets, which may be formed around the newborn stars. Low metallicity (the number of metals) in the LMC makes it a model of how the early, not yet accumulated many heavy elements of the galaxy had developed. The age of the LMO itself is not so small, its properties are explained rather by its small mass. A relatively small distance from the Earth (160 thousand light-years) makes it also a convenient object for study. This observation will allow astronomers to more accurately simulate the processes that led to the creation of the first complex molecules in the early stages of the existence of the universe.